Tesla aims to start the European rollout of its Model 3 in February. 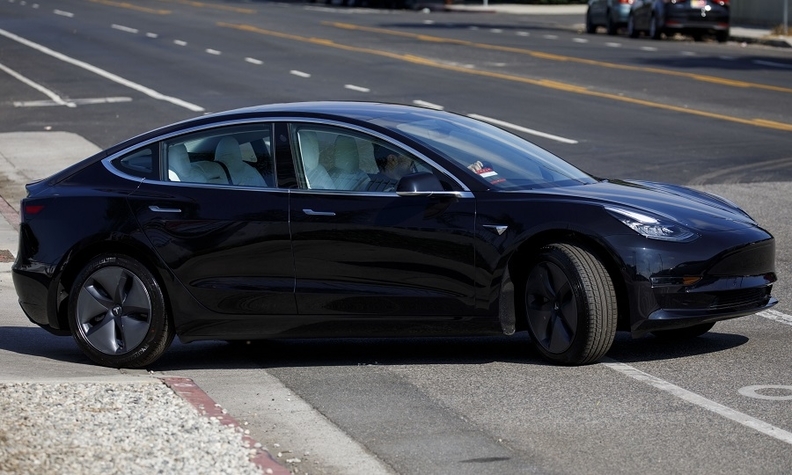 Tesla has yet to obtain approval from authorities in Europe to begin selling the Model 3 in the region, though this is not expected to impede the automaker from starting deliveries next month, according to a person familiar with the matter. The company has been working in close collaboration with authorities and expects to receive certification after some personnel return from the holidays, said the person, who asked not to be identified because the deliberations are not public. This timing is in line with what Tesla has been targeting for months, the person said. Starting Model 3 deliveries in Europe is a key priority for CEO Elon Musk. He has pointed to sales of the sedan in Europe and China as a main reason he is not concerned about any potential setback caused by the U.S. federal tax credit toward Tesla purchases halving to $3,750 as of Jan. 1. Tesla is targeting the BMW 3 series and VW Golf with its Model 3. While pickup trucks and SUVs account for about 70 percent of U.S. vehicle sales, Europeans still favor cars. “We’re excited to bring Model 3 to Europe and China early next year, given that the market for midsize premium sedans in those regions is even larger than in North America,” Musk said during the October earnings call. Tesla previously obtained approval for safety, noise, environmental and production requirements through the Dutch regulator known as RDW. Under European Union rules, once an automaker’s new vehicle has been certified by one national authority, the approval is applicable across the trade bloc. The company has started receiving systems-type approval for components of the vehicle and is awaiting whole-vehicle-type approval, which is expected to be imminent, the person said. Therese de Vroomen, a spokeswoman for RDW, said the vehicle authority does not provide information about its type approval process. Concerns about the shrinking U.S. tax credit and Tesla’s decision to cut prices by $2,000 to partially offset the lower incentive sent the automaker’s shares plunging 9.7 percent during the first two trading days of the year. The company also reported fourth-quarter deliveries Wednesday that fell just short of analysts’ estimates. Tesla said on Friday it plans to start delivering Model 3s to China customers in March. The automaker aims to accelerate Chinese sales that have been hit hard by the impact of trade tensions between Washington and Beijing. The company said the starting price for a Model 3 in China would be 499,000 yuan ($72,000). Tesla cut prices for its Model 3 last month, the third time in the last two months for the automaker to adjust prices in China. In November, Tesla cut the prices of its Model X and Model S in China by 12 to 26 percent. Tesla has opened a tender process to build a $2 billion plant in Shanghai -- dubbed a Gigafactory -- and at least one contractor has started buying materials, Reuters reported earlier last month. The factory, Tesla's first in China, marks a major bet by the EV maker as it looks to bolster its presence in the world's biggest auto market where it faces rising competition from a swathe of domestic rivals, while its earnings have been hit by increased tariffs on U.S. imports.